Five Sax is a modern-style saxophone quintet featuring five musicians from around the world. The individual members are all established solo musicians who represent a significant international presence and hold many prizes from important national and international competitions. They converged in Vienna from all around the world, united by a modern conception of virtuosity and the constant urge to push the limits of performance. The ensemble began in an unusual way: performing street theater in the center of Vienna. Their first year performing together was an unforgettable experience of running from the police, surviving freezing temperatures and dealing with angry shopkeepers. Their “starving artist” past is echoed in their concerts by their use of theatrical elements, their strong connection with the audience, and their spontaneous approach to making music. The five musicians hail from Poland, Italy, Belgium, the USA and Chile, and each brings his own unique and vibrant personality to the group. The ensemble’s imaginative programming mirrors the diversity of its members; rooted in classical music, while venturing into American jazz, south-American Latin styles and European folk music. 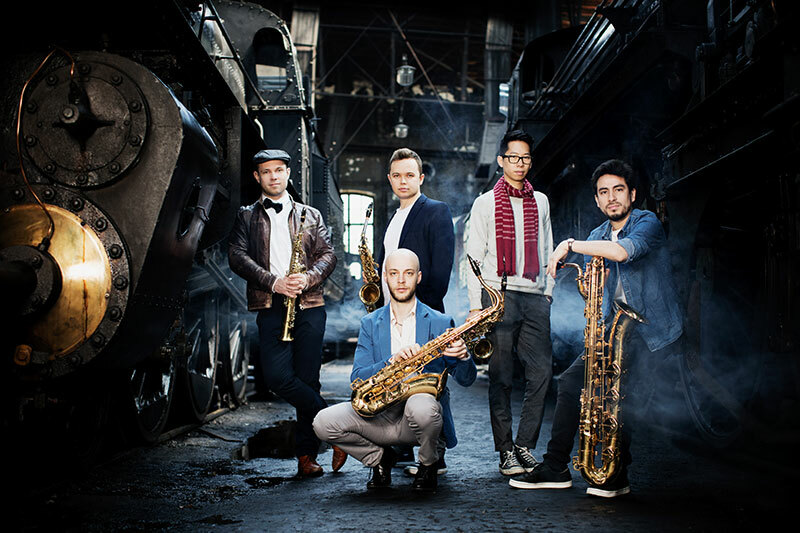 Five Sax has performed in some of the most prestigious halls such as the Konzerthaus (Vienna), the Teatro del Lago (Chile), the National Concert Hall (Taipei) and the Concertgebouw (Amsterdam).